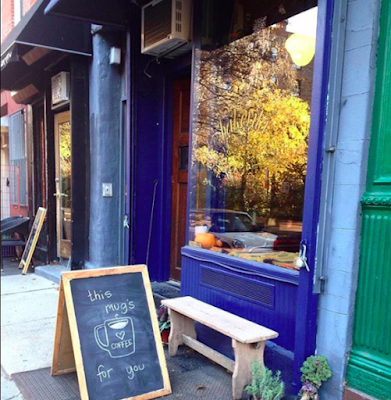 With the opening of one Brooklyn-based coffee shop in the East Village ... comes news of another like-minded establishment closing. The owners of Bakeri NYC announced yesterday that they are closing their cafe-bakery at the end of the month at 627 E. Sixth St. between Avenue B and Avenue C.
They didn't provide a reason for the closure, saying on Instagram: "We are so grateful to have been part of such a lovely neighborhood! Thank you all for all the love and support." Bakeri, with locations in Williamsburg and Greenpoint, opened in October 2016 and sells homemade bread and pastries as well as Counter Culture Coffee. It is a good place... foot traffic is tough on the block, though. There's also construction on both ends of the block (here and here). Nooo! This is one of my favorite places for coffee/tea and a snack. Really nice people and a chill atmosphere. I worried about them being on this block with the construction and have to wonder if that hindered foot traffic. I'm really going to miss them. BTW, I love that in the comment verification, I am shown photos of "storefronts" that are obscured by scaffolding. It was a very, out of site - out of mind, location. Don’t worry guys. I live in the building and this sweet little spot is being taken over by there neighbors. New owners will announce opening very soon,with free wi-fi. Layout will stay the same. yeah but what about their sour-dough rye?